If you haven't heard, Robert Downey Jr has signed on for Captain America 3. The current plan is for the story to be about Civil War. Does this mean no Iron-Man 4 I wonder? That's the general consensus right now. My biggest complaint with Civil War was that I didn't buy Stark's motivation. It might have been because I associate his personality too much with his personality in the movies. I think they would drastically have to change him in the movies for us to believe that he would side with the government on anything. Also, wasn't there the whole selling out his friends thing? A good article, and some intreaging ideas. 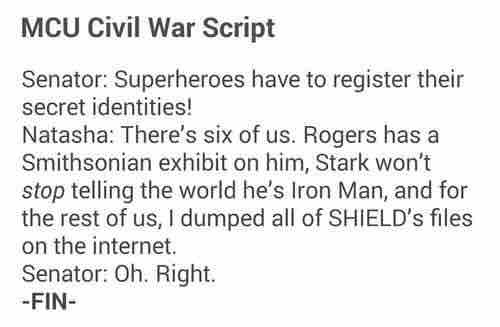 I wouldn't be surprised if it took a little longer for Civil War to develop in the movies, though. "some dumb guy doing parkour in Hell's Kitchen. " Pretty much my take on him too. There are literally no secret super heroes in the MCU, unless they change the whole premise the Civil War story makes no sense. I would be happy if they dropped the whole registration act thing completely. I'm sure they can make it about something else. That's not even the dumbest version. Apparently in the licensed GB game, his powers are interpreted as being able to see invisible power-ups. Guys, the secret identities was only part of it - They had to register and work for the Government - Essentially become the government's property. In the comics the character who had the biggest problem with the secret identity was Spider-Man who isn't even currently in the MCU. Captain America was leading the anti-registration team and he didn't have a secret identitiy then either. Yeah, if memory serves, if someone had superpowers, the choices were to join the Avengers/SHIELD, or get locked away as a criminal.